This child is 20 years old now. The speaker was Rebecca Paul, the first president of the Georgia Lottery Corp. The year was 1996. Her office window overlooked a spot of land south of the under-c0nstruction Centennial Olympic Park. 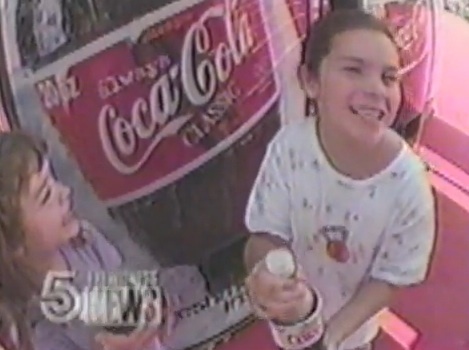 “Coca Cola is building a theme park that’s entirely a tribute to its own product!” OK, the quotes are based solely on my memory 14 years removed — close enough, and good enough for historians, but as verbatim quotes go, they’re suspect. I was in Paul’s office on a story I can no longer remember (unlike the quotes!). The Olympics were just days away from starting in Atlanta. Somehow, WAGA was allowing me to continue a self-assigned feature segment called Closer Look. Paul’s idea sank in and triggered a dim light bulb somewhere within the “story idea” quadrant near my brainpan. Photog Rodney Hall and I arranged to spend all day at the place called Coca Cola Olympic City. It had entertainment and such. But mostly, it had Coca Cola — sold in machines for two bucks a pop. At that time, the price was appalling to me. As was the entire joint. I never said that, of course, in the body of the piece — which to this day, remains one of my all-time career faves (thanks in no small part to Hall’s video and the editing genius of Andi Larner). 1:40 The Coke machine spits out the reporter’s dollar bill. You have to listen closely for the belch, which Larner was understandably disinclined to use. The belch was naturally delivered after consuming a bottle of the prevalent product. I made sure the Beta SP tape was rolling in Hall’s camera when it erupted. The belch comes at the conclusion of a song sung by an insufferably cute group of youths, with the lyrics “we’re the Coca-Cola family.” There are four beats punctuating the song following the line. The belch is deftly but unmistakably mixed into the last of the four beats. Go ahead and listen. It’s a beautiful sound, as belches go. More than anything else, it provided a sound that definitively symbolized the excess of the facility and its namesake product. But except for Larner, Hall and a few people to whom I pointed it out, not a single person ever noticed. Though I expected the question, nobody asked: Did you belch loudly in that story, just before the outcue? Why, yes. Yes I did. H/T to Mitch Leff of Mitch’s Media Match for recently fishing this from a tape he’d kept in a drawer somewhere for lo these many years. Thanks, Mitch. This entry was posted in WAGA and tagged coca-cola on May 5, 2010 by live apt fire. Doug Richards is a reporter at WXIA-TV. This is his personal blog. WXIA-TV has nothing whatsoever to do with this blog, under any circumstances, in any form. For anything written herein, Doug accepts sole credit and full blame. Follow him on Twitter: @richardsdoug. All rights reserved. Thanks for visiting. You know, I was 12 when the Olympics came to Atlanta (“…the world is coming to Atlanta, we’ll show them who we are.” You remember that 11Alive jingle? I do!). My Mom, Dad, two sisters and I would walk around “Olympic City” and even at the ripe old age of 12 I realized there was something disgustingly commercial about the whole thing. Even before watching your video, my first memories of “Olympic City” were red/white everywhere, giant coke bottles sticking up out of the ground, coke songs after coke songs, and yes – vending machines charging an unheard off $2 (it was the first time I heard my dad use a swear word, but I also remember thinking that the coke bottle was huuuuge: I had never experienced a 20 oz bottle before the Olympics). I also remember my mom complaining about the commercialism of it all, and the poor nutrition that we girls were receiving after consuming not water, but rather a caffeinated, sugary beverage in the hot Atlanta summer heat. 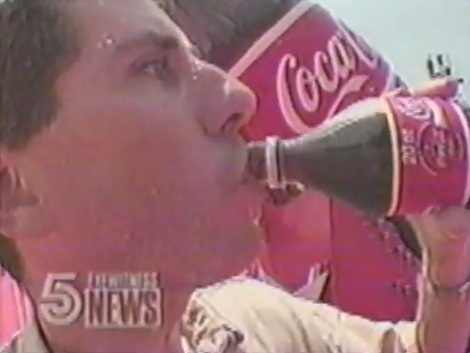 I remember feeling so proud that my hometown had the honor of hosting the Olympics, and then feeling red with embarrassment as I began to realize just how ridiculous “Olympic City” looked, and yet this was the image Atlanta/Coca Cola was presenting to our worldly visitors. And then I became mortified as my sister beat me on “Olympic City’s Olympic Race Track”. I knew I was no match for the “video screen Flo Jo”, but my 9 year old sister?! Come on!!! I decided then that I would never run in public ever again. Or at least try out for track and field. I was 14 years old when the Olympics came. I tripped and fell at Coke Olympic City while racing the “video screen Flo Jo”. Not a good day. Fooled by the headline. I thought this would be about Richard. I almost headlined the post “Richards, the belcher” but I lost my nerve out of my abundant respect for and fear of Mr. Belcher. I think it’s a good idea to carry a healthy fear of Mr. Belcher. Like the belch itself, I think that piece was just a bit too subtle. Other than the “crass commercialism” question, I never would have gotten that the point was to ridicule how over-the-top it was. It just looks like three minutes of Coke-praise. ha ha ha! So many of Richards’ pieces are plainly subversive. I was always a little amazed they let Doug submit half of his pieces. 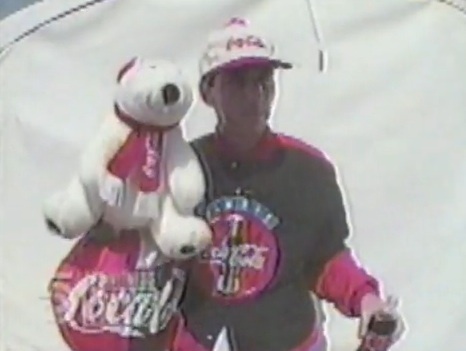 It is almost too plain that Doug is making fun of the commercialization of the ’96 Olympics and its major sponsor, Coca-Cola. But what did we expect? Bill Campbell was running around telling people the Civil War history would be knocked down, he ran out the homeless and poor, probably got his pockets stuff, and Billy Payne was more than happy to go along. Or was it Payne whose pockets got stuffed? Hah, in fact, Billy Payne and Campbell were perfect reps of the Atlanta Olympics. Payne as the cracker with letters from UGA and Campbell as the angry black man whose parents made him a test case for deseg in Charlotte. . . . but they both were united by green. The commercialism fit the players well. The Inside Fastball – new! Add LAF to your FB feed! Reporter Threatened! Details at 5!